“United States of America vs. Ramzi Ahmed Yousef…,” Untied States Court of Appeals, April 4, 2003, 8, http://news.findlaw.com/cnn/docs/terrorism/usyousef40403opn.pdf. 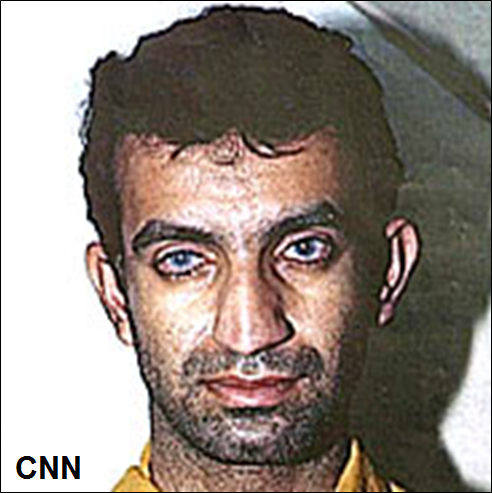 Following his February 1995 arrest in Islamabad by the FBI and Pakistan’s Inter-Services Intelligence (ISI), Yousef was extradited to the United States for legal proceedings and convicted on charges of murder and conspiracy to murder.“Plane terror suspects convicted on all counts,” CNN, September 5, 1996, http://www.cnn.com/US/9609/05/terror.plot/. Yousef is serving a life sentence plus 240 years at the federal maximum-security prison in Florence, Colorado.“Find an inmate [Ramzi Yousef],” Federal Bureau of Prisons, https://www.bop.gov/inmateloc/. A judge on Yousef’s case, U.S. District Court Judge Kevin Thomas Duffy, has referred to Yousef as a “cold-blooded killer, completely devoid of conscience.”Richard A. Serrano, “After 15 years in solitary, convicted terrorists pleads for contact with others,” Los Angeles Times, February 16, 2013, http://articles.latimes.com/2013/feb/16/nation/la-na-yousef-solitary-20130217. Benjamin Weiser, “Mastermind Gets Life for Bombing of Trade Center,” New York Times, January 9, 1998, http://www.nytimes.com/1998/01/09/nyregion/mastermind-gets-life-for-bombing-of-trade-center.html. In 1986, Yousef left Kuwait and studied electronic engineering in Swansea, Wales, in the United Kingdom. He returned to Kuwait in 1989 after completing his studies, and moved to Pakistan in the summer of 1990.Christopher S. Wren, “Charged as Terror Master, Surrounded by Mysteries,” New York Times, May 29, 1996, http://www.nytimes.com/1996/05/29/nyregion/charged-as-terror-master-surrounded-by-mysteries.html. Bob Martin, “Vetting for terror ties has failed for two decades,” New York Post, December 14, 2015, http://nypost.com/2015/12/14/vetting-for-terror-ties-has-failed-for-two-decades/. Terry McDermott, “The Mastermind,” New Yorker, September 30, 2010, http://www.newyorker.com/magazine/2010/09/13/the-mastermind. Ultimately designed to topple both towers, the 1,500 pound bomb—planted in a truck parked in the North Tower’s basement garage—created a hole of 200 feet by 100 feet, killing six people, injuring more than 1,000 others, and causing $500 million in damage. On the night of the bombing, Yousef fled the United States on a pre-booked Pakistan International Airways flight to Karachi, where he joined KSM.Robin Wright and John-Thor Dahlburg, “Legwork, Luck Closed Net Around Bombing Suspect: A mysterious informer’s tip capped an intense search for alleged mastermind of trade center blast,” Los Angeles Times, February 12, 1995, http://articles.latimes.com/1995-02-12/news/mn-31228_1_trade-center-bombing/2. By May 1993, four of Yousef’s five accomplices in the World Trade Center bombing had been arrested. All four were sentenced to 240 years in prison.“1993 World Trade Center Bombing Fast Facts,” CNN, February 21, 2017, http://www.cnn.com/2013/11/05/us/1993-world-trade-center-bombing-fast-facts/. The fifth accomplice, Omar Abdel-Rahman, was convicted in October 1995 and sentenced to life in prison.“1993 World Trade Center Bombing Fast Facts,” CNN, February 21, 2017, http://www.cnn.com/2013/11/05/us/1993-world-trade-center-bombing-fast-facts/. Yousef did not stay in Karachi for long. In early 1994, he and KSM moved to Manila, Philippines, believing it would be a relatively easy place from which to plan terrorist attacks.Terry McDermott, “The Mastermind,” New Yorker, September 30, 2010, http://www.newyorker.com/magazine/2010/09/13/the-mastermind. That summer, the pair—alongside accomplices Abdul Hakim Murad and Wali Khan Amin Shah—began to plan the “Bojinka” plot, the intended bombing of 12 U.S. commercial passenger planes over the Pacific Ocean within two days. In addition to the plot, Yousef and KSM planned to bomb U.S.-bound cargo carriers by smuggling explosives on board, and to assassinate Pope John Paul II and U.S. President Bill Clinton during the leaders’ respective trips to Manila in late 1994.National Commission on Terrorist Attacks upon the United States, Thomas H. Kean, and Lee Hamilton. 2004. The 9/11 Commission report: final report of the National Commission on Terrorist Attacks upon the United States. (Washington, D.C.): 489, http://govinfo.library.unt.edu/911/report/911Report.pdf. Yousef and KSM prepared for the Bojinka plot by building and testing explosives—including at an empty Manila movie theater.Raymond Bonner and Benjamin Weiser, “Echoes of early design to use chemicals to blow up airliners – Asia – Pacific – International Herald Tribune,” New York Times, August 11, 2006, http://www.nytimes.com/2006/08/11/world/asia/11iht-web.0811manila.2447764.html. “Plane terror suspects convicted on all counts,” CNN, September 5, 1996, http://www.cnn.com/US/9609/05/terror.plot/. On February 7, 1995, Yousef was captured in a joint FBI-ISI raid in Islamabad and swiftly extradited to the United States to face trial. Judge Kevin Thomas Duffy noted that during Yousef’s trial, he “was collecting urea in his jail cell, a main ingredient in the WTC bomb.” Duffy also noted that Yousef had “attempted to obtain the particular type of cheap wristwatch that had been used as the timing device” in bombs intended for airplanes.Richard A. Serrano, “After 15 years in solitary, convicted terrorists pleads for contact with others,” Los Angeles Times, February 16, 2013, http://articles.latimes.com/2013/feb/16/nation/la-na-yousef-solitary-20130217. Yousef was found guilty for his roles in the Bojinka plot and the World Trade Center bombing on September 5, 1996, and November 12, 1997, respectively.“Plane terror suspects convicted on all counts,” CNN, September 5, 1996, http://www.cnn.com/US/9609/05/terror.plot/; “United States of America vs. Ramzi Ahmed Yousef…,” Untied States Court of Appeals, April 4, 2003, 8, http://news.findlaw.com/cnn/docs/terrorism/usyousef40403opn.pdf. Ramzi Ahmed Yousef“Abdul Basit Balochi (Mahmoud Kareem), alias Ramzi Ahmed Yousef,” Washington Post, September 12, 2007, http://www.washingtonpost.com/wp-dyn/content/article/2007/09/12/AR2007091201375.html. Ramzi Yousef planned and executed the 1993 World Trade Center bombing and the thwarted 1995 “Bojinka” plot. “Yes, I am a terrorist and I am proud of it. And I support terrorism so long as it was against the United States Government and against Israel, because you are more than terrorists; you are the one who invented terrorism and [are] using it every day.”“Excerpts From Statements in Court,” New York Times, January 9, 1998, http://www.nytimes.com/1998/01/09/nyregion/excerpts-from-statements-in-court.html#.